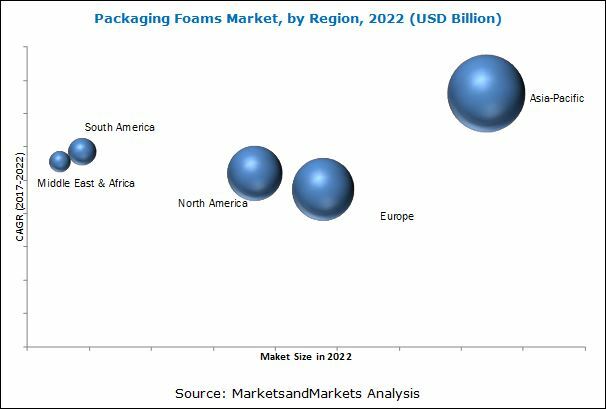 [186 Slides Report] The Packaging Foams Market was valued at USD 12.81 Billion in 2017, and is projected to reach USD 17.21 Billion by 2022, at a CAGR of 6.09% from 2017 to 2022. This report aims to estimate the market size and future growth potential of the packaging foams market across different segments, such as structure type, material type, service type, and region. Factors influencing the market growth such as drivers, restraints, opportunities, and industry-specific challenges, along with competitive landscape of the market are presented in this report. In this study, 2016 has been considered as the base year and 2022 is considered as the projected year. Top-down and bottom-up approaches have been used to estimate and validate the size of the packaging foams market, and to estimate the sizes of various other dependent submarkets. The research study involved the use of extensive secondary sources, directories, and databases such as Hoovers, Bloomberg, Chemical Weekly, Factiva, British Plastic Federation (BPF), Brazilian Packaging Associations (BPA), Japan Plastic Industry Federation (JPIF), Polyethylene Foam Insulation Association (PEFIA), Flexible Packaging Association, National Association of Container Distributors (NACD), Alliance of Foam Packaging Recyclers (AFPR) and other government as well as private company websites to identify and collect information useful for the technical, market-oriented, and commercial study of the packaging foams market. After arriving at the overall market size, the total market has been split into several segments and subsegments. The figure given below provides a breakdown of primary interviews conducted during the research study. The value chain of the packaging foams market starts with sourcing of basic raw materials. The basic raw materials used in the manufacturing of packaging foams are resin, polyols, naphtha, and additives, among others. These raw materials are produced by major manufacturers such as BASF (Germany), and Borealis Ag (Australia). This research report categorizes the packaging foams market based on structure type, material type, service type, and region. The packaging foams market is projected to reach USD 17.21 Billion by 2022, at a CAGR of 6.09% from 2017 to 2022. This growth is mainly driven by the increasing demand for packaging foams from food service and protective packaging service type. In addition, high demand for packaging foams from the Asia-Pacific region has contributed to the growth of this market. Packaging foams are based on material types such as PS, PU, PO, and others including PVDF and PVC. In 2016, the PS material type accounted for the largest market share, in terms of volume and value, followed by PU and then PO packaging foams. PS is the most versatile type of polymer foam, which is a synthetic aromatic polymer made from the monomer styrene. EPS and XPS are the two types of PS packaging foams. EPS acts as an insulator, as heat cannot travel through easily. It is used in manufacturing flotation devices, insulation, egg cartons, sandwiches, hamburger boxes, and coffee mugs. Based on structure type, the flexible segment of the packaging foams market is projected to grow at the highest CAGR between 2017 and 2022. Business that focus on protecting their products in the delivery process can go for flexible foam for their packaging needs. It is often used for extremely sensitive products such as computer parts, fruits, electronic parts, and jewelry. The packaging foams market in Asia-Pacific is expected to grow at the highest CAGR between 2017 and 2022, in terms of value and volume. This growth is mainly attributed to high economic growth, followed by growing e-commerce business in the Asia-Pacific region. One of the most significant factors restraining the growth of the packaging foams market includes volatility in raw material prices. This further causes fluctuations in the prices of packaging foams products. Key players operating in the packaging foams market include Armacell (Germany), JSP (Japan), Zotefoams Plc. (U.K), BASF (Germany), Borealis Ag (Austria), and Sealed Air Corporation (U.S.), among others. Diverse product portfolio, strategically positioned R&D centers, continuous adoption of development strategies, and technological advancements are factors strengthening the market position of these companies. 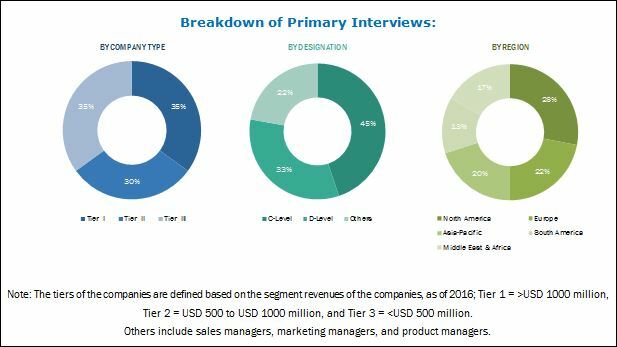 These companies have adopted various organic and inorganic growth strategies to enhance their current market share in the packaging foams market.